These flavorful slow cooker beef enchiladas are topped with a creamy white sauce and salsa verde. Easy to prepare, these salsa verde beef enchiladas are sure to be a hit come mealtime. You know how much I love my slow cooker recipes and this is a good one. If you’re not a big fan of salsa verde, you can easily swap it out for your favorite red tomato salsa. These beef enchiladas are filled with the same slow cooker beef that I use in my salsa verde beef tacos recipe, and they are topped with the same creamy white sauce that I pour over my cheesy chicken enchiladas. Oh yeah. While you will have to wait for the beef to slow cook for 8 hours, the additional prep and cook time is very minimal. I don’t know if it is the acid from the tomatoes used in the salsa verde, but the beef comes out so wonderfully tender. This recipe is a keeper for sure and one I find myself making over and over again. Coat 6-quart slow cooker with cooking spray. In a large pan, heat olive oil over medium-high heat. Season the beef with cumin, salt and pepper. Add to the pan and cook for about 3 minutes on each side, until browned. Place meat in the slow cooker. Add onions, garlic, and salsa verde. Cover and cook over low heat for 8 hours. Shred the meat with 2 forks. Set aside. Preheat oven to 350 degrees F. Prepare a 9-inch by 13-inch pan by lightly spraying with cooking oil. Set aside. Prepare the white sauce: In a saucepan over medium heat, melt the butter. Add the flour and whisk constantly for one minute. Add the chicken broth and continue to whisk until smooth. Stir in the sour cream and remove from heat. Note: If you like, you can begin preparing the sauce about 15 minutes before your beef is finished cooking. Otherwise, it doesn't take long to prepare the sauce. To assemble enchiladas, fill each tortilla with beef, roll and place in casserole dish seam side down. Pour white sauce over the top of the enchiladas. Bake for 20 minutes. 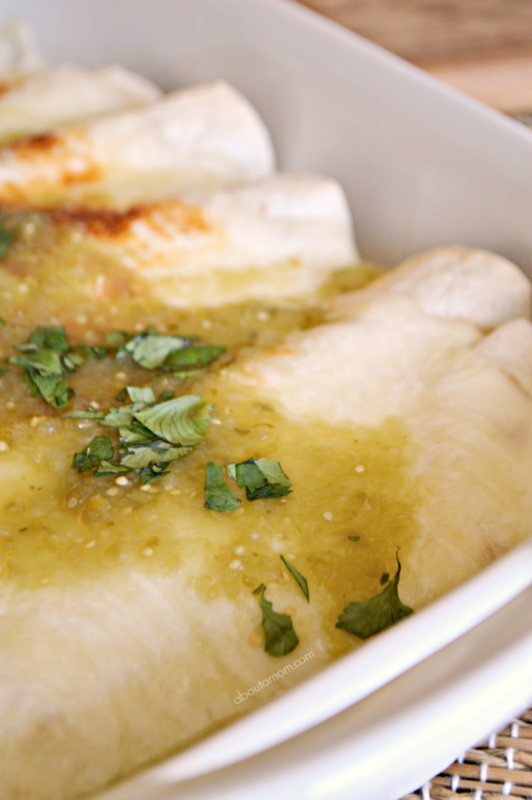 To serve, you can optionally pour some additional salsa verde over the enchiladas and sprinkle with chopped cilantro. This recipe makes a decent amount of beef, and you will most likely have leftovers to use for tacos or your basic beef enchiladas with red sauce another night. You might also enjoy these cilantro lime rice and tangy beef and noodle casserole recipes. Looking for a new slow cooker? This is the one that I use. I love the handle on the top that makes it easy to bring to parties. Here’s my affiliate link to check it out on Amazon. June Reader Appreciation Giveaway – $50 Visa Gift Card! These enchiladas look delicious! I love to order that when I’m out at restaurants but have never made my own. Thanks for sharing! I’ve never made anything like this. I’m so excited to finally have a slow cooker, as recipes like this are so nice! I’d love to try it! These look so good and I’m amazed and how well and pretty they look since they were cooked in a crockpot. I love how easy these look! How easy to make the beef in a slow cooker. I love the spices used. Definitely going in my rotation recipes! These look amazing and I would love to make these for my hubby. He loves recipes similar to this! I really appreciate your wonderful blog and enjoy your recipes! Thanks for your generous giveaways as well! Because the Slow Cooker Salsa Verde Beef Enchiladas looks as delicious as it does, I can’t wait to try this special recipe out. I only hope I will be able do as good as you did in the heartwarming photos. There is nothing more exciting to me than surprising my family with a new recipe. I know that this dish will become a family favorite. Thank you! I love enchiladas! This looks great! Can’t go wrong with shredded beef and green sauce. Yum! I love enchiladas! And you definitely can’t go wrong with a meal cooked in the slow cooker. 🙂 Thank you so much for sharing this, I can’t wait to try them! I love Mexican food and any chance I get to use my slow cooker! So this recipe is right up my alley! Thanks for sharing! We love enchiladas, and I love using my slow cooker! I like to make Mexican rice to go along with enchiladas. I read this way too close to lunch time. How delicious! I’m going to have to attempt to make these!